The faint constellation Ophiuchus the Serpent Bearer appears in the southern sky at nightfall, and descends into the southwest sky as evening deepens into late night. Look for Ophiuchus above the bright ruddy star Antares, the brightest in the constellation Scorpius the Scorpion. Ophiuchus’ brightest star – called Rasalhague – highlights the head of Ophiuchus and is nowhere as bright as Antares, the star that depicts the Scorpion’s beating heart. 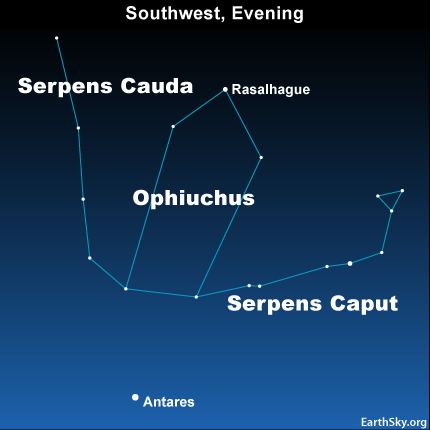 Ophiuchus will continue to be visible in the southwest sky (above Antares) on August and September evenings. 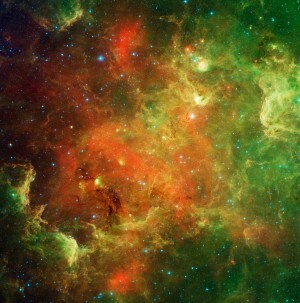 Ophiuchus is sometimes called the “13th” or “forgotten” constellation of the zodiac. The sun passes in front of Ophiuchus from about November 30 to December 17. Yet no one ever says they are born when the sun is in Ophiuchus. On sky maps, Ophiuchus the Serpent Bearer is depicted as holding Serpens the Serpent, which is considered a separate constellation. According to ancient Greek star lore, Ophiuchus is Asclepius, the physician who concocted a healing potion from the Serpent’s venom, mixing it with the Gorgon’s blood and an unknown herb. This potion gave humans access to immortality, until the god of the underworld appealed to Zeus to reconsider the ramifications of the death of death. Even today, the Staff of Asclepius – the symbol of the World Heath Organization – pays tribute to the constellation Ophiuchus the Serpent Bearer.